First, a little bit about our very special elk. We raise these majestic animals in beautiful Minnesota, which consistently ranks as one of the best states for quality of life in the entire country. Just like the people of Minnesota, our elk are hearty and healthy, grazing in a pollution-free environment on hundreds of acres across Wolf Creek Elk Ranch. Our Elk Antler products are rooted in this pristine environment: at Wapiti Labs, we create dynamic dog supplements that draw upon the power of nature. Help Your Dog Breath Easy! If you’re searching for a way to keep your dog happy, Wapiti’s all-natural Chest supplement will keep him fetching his ball all day long! Do you want to keep your dog in peak physical condition? Try Wapiti Labs’ Strength Supplement for Dogs! 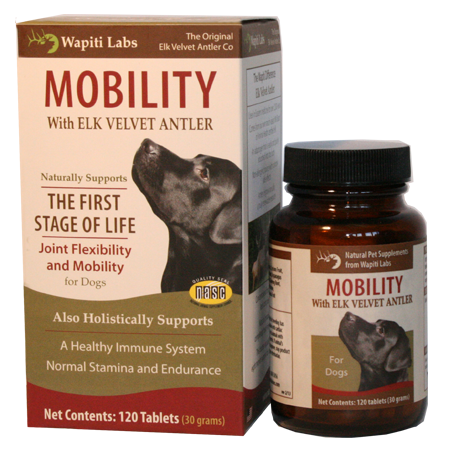 If you’re searching for the perfect supplement to keep your dog strong, try our Mobility Supplement for Dogs today! Is your dog having digestive problems? Try Wapiti Labs’ special GI Tract Formula for dogs! If you’re searching for a way to keep your dog healthy, Wapiti’s all-natural GI Tract supplement will keep your dog happy – and your sense of smell happy too! Give Your Dog A Break! If you’re searching for a way to keep your dog active, whether it’s on the hunt, in front of a sled or just playing with the ball in the yard, Wapiti’s Recuperate Formula will help him recover in no time! Our customers often ask us this question—they’re curious how we formulate our supplements from field to laboratory. At Wapiti Labs, our process is in tune with the rhythms of nature, respecting that all animals deserve comfort and respect. Once a year at Wolf Creek Elk Ranch, antlers are removed from healthy bulls in a process that’s as humane as possible, creating minimal stress for the animal. Directed by a board certified herd veterinarian, the entire process is designed to honor and support the elk while collecting life-giving biological material to benefit your dog, whether he’s a Golden Retriever, a Boston Terrier, a Springer Spaniel or an adorable mutt. Veterinarians from both Western and Eastern traditions love our products because they’re backed by scientific research, and formulated with the long-term health of each dog in mind. It’s no wonder that our company is endorsed, recommended and distributed by veterinarians practicing both Eastern and Western herbal medicine. Through a proprietary extraction process, we produce supplements drawing upon the tremendous medicinal properties of Elk Velvet Antler, enhanced by select Chinese herbs proven to have anti-inflammatory, healing and longevity-promoting effects. We know your dog is a completely unique creature, with different needs when it comes to health and quality of life. To honor these differences and cater to your dog’s specific needs, we’ve created a range of Elk Antler supplements that are specifically tailored to different dogs who need support in different areas. Most of our customers are quick to recognize when their older dogs need a little extra help. Maybe your Rhodesian Ridgeback has taken to napping for most of the afternoon, walks up the stairs instead of runs, and has started eating a little less. You chalk up these changes not to a major health problem but rather to the natural aging process. For senior dogs, we have formulated supplements especially designed to support dogs in the second stage of life, who may need help with energy, strength, endurance, and mobility–from maintaining optimal organ function to promoting joint flexibility. For younger dogs, we offer Elk Velvet Antler supplements with natural ingredients that support kidney and immune system health, as well as joint mobility and flexibility. Your young dog may actually benefit from supplementation just as much as your older dog. Whether your pooch is senior or junior, our strength products give pets an extra boost of vitality–and they’re helpful even for animals who are in healthy condition but just need assistance recuperating. For example, we offer a concentrated liquid formula–our Elk Velvet Antler Strength Supplement for Dogs–which targets a range of strength issues. It’s perfect for hunting dogs that need support on the second day of hunting, or for the tiniest newborn puppy who is failing to thrive. Does your dog have occasional stomach upsets or respiratory issues? We’ve developed supplements that support your dog’s delicate G.I. tract, which reduces stomach discomfort by harmonizing the stomach with our proprietary herbal blend. For breathing issues, our Chest Herbal Supplement supports respiratory function by clearing and expanding the chest, promoting easy breathing.